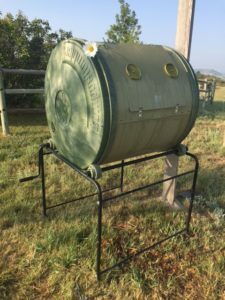 We do lots of gardening, so I don’t mean to brag or anything, but we have our own composter. (I know, I’m prideful that way.) But you know me! I can create an analogy out of anything, even a composter. (I need to get a life.) Well, anyway, with composting, you have to turn the crank of the barrel every day so the grass clippings, eggs shells, coffee grounds, dead leaves, and chicken poop get all mixed up. And two weeks later, you have the most beautiful dirt. It does wonders for the soil of the garden. So here’s what I’ve been thinking. Old, icky stuff goes into the composter and voila! Transformation. What if real life were that easy? Regrets, doubts, sins, frustrations in…and voila! Transformation. In a sense, that’s like the Christian life. I’m serious. One of the big deals about Christianity is forgiveness. We don’t have to carry around our chicken poop. We can give it to God, ask for forgiveness, and we’re clean. But we can also give Him other stuff too, like regrets, doubts, and frustrations. I tried this a few days ago. I was frustrated about something, so I symbolically dumped it into the composter and said, “Here God, fix it please,” as I turned the crank. And not only that, but the simple act of “giving it to God” made me quit carrying it around and dwelling on it. I was open to new ideas. And…(I’m not making this up), I got a new insight about it. So there you have it. Happy composting!